NY4P is the only independent watchdog for all the Cityâ€™s parks, beaches and playgrounds. They aren’t new either, they have been doing this for nearly 100 years. NY4P has 4 goals with releasing this report. 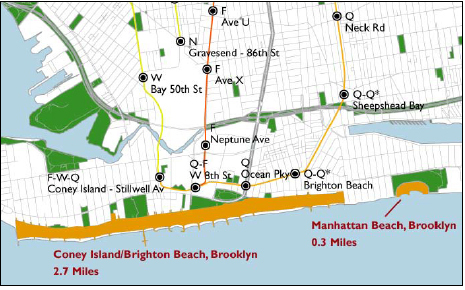 To provide city residents with an assessment of how each of the seven beaches is performing in comparison to each other. This easily accessible online information helps communities advocate for improved services for their beaches. To provide an independent assessment of beach performance from year to year against a defined minimum level of service. This creates accountability for providing both this defined level of service as well as improvements for every beach. To spark debate among communities, public agencies and advocates about how best to maintain and improve public beaches in need. The Report Card on Beaches provides a valuable service by identifying those beaches in greatest need, but more importantly, The Report Card indicates how we might begin to address that need. To highlight high- and low performing beaches, as well as systemic issues, in order to identify and implement best practices citywide. Waterfront access in New York City is precious, and the 14 miles of public beaches offer some of the few points along the shoreline where any New Yorker can jump in the water and swim. Beaches also afford opportunities for boating, birding, strolling, surfing, and relaxing. The Parks Department is responsible for ensuring that beaches are clean, safe and available for public use. The Report Card on Beaches highlights and monitors this important component of the Parks Departmentâ€™s inventory, and the results show that our beaches need additional care. Results are below the fold. Kiddie beach isn’t going to be on the list. Although some maintenance repairs were needed, Manhattan Beachâ€™s pathways were free of litter, broken glass, and weeds. This was the highest-scoring feature at the beach. The shoreline at Manhattan Beach also performed relatively well. Beyond the consistent challenge of litter, the beach was in excellent condition, providing open, safe beaches for public use. Bathrooms at Manhattan Beach performed above the citywide average, receiving 75%. Some damaged equipment was found, including stall doors, locks, and sinks, but bathrooms were open for use and generally provided toilet paper and paper towels. Manhattan Beachâ€™s drinking fountains were the lowest scoring in the city. Leaks, clogs, and non functioning fountains were all found, as well as damaged spigots and structures. Drinking fountains are a consistent challenge for the Parks Department to maintain. The Coney Island and Brighton Beach boardwalk was relatively safe with no broken glass found and benches intact and safe. Beach bathrooms were 95% open and available for use. The toilets and sinks were typically in working order, and bathrooms were free of graffiti. impacted 40% of surveyed areas. These negative conditions had a significant impact on the shoreline score for this beach. Although pathways scored well, one quarter suffered from wooden boards that were raised or missing, causing potential trip hazards. Maintenance issues including spilled paint and loose nails should be addressed.